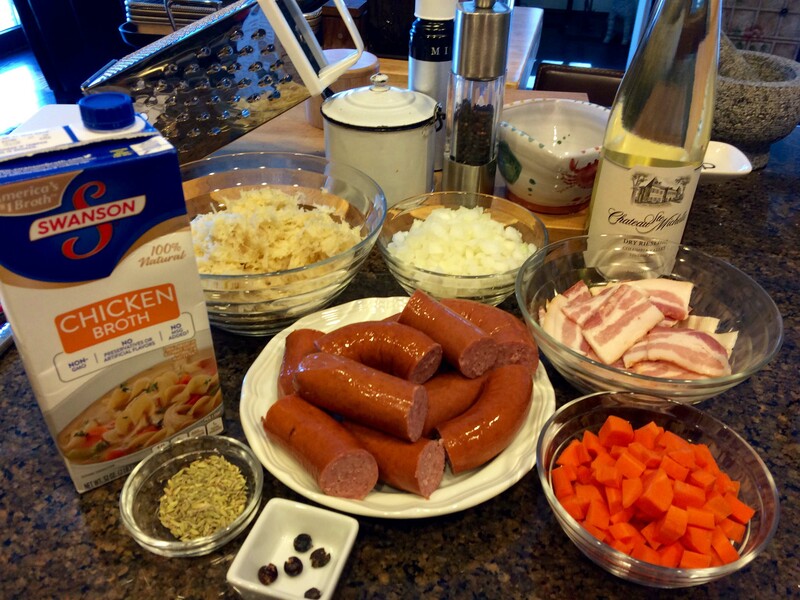 This is not a Polish joke: What do you do when your husband asks you to make kielbasa? You make it. 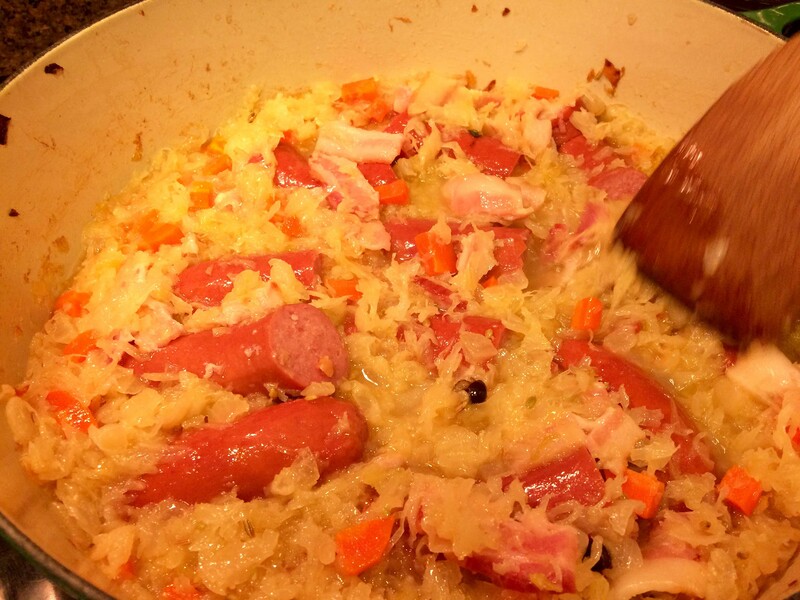 After five years of marriage, my better half, who is of Polish heritage, asked me for the first time in our relationship to recreate a dish his mother often made: Kielbasa with Sauerkraut. I admit I was somewhat intimidated to attempt to replicate a childhood memory. But this was the first time he’s ever requested an eastern European meal. When I agreed, he informed me, most enthusiastically, that he had already found a recipe that reminded him of the original. It was from a 1995 issue of “Bon Appetit” that had been published on the “Epicurious” website. 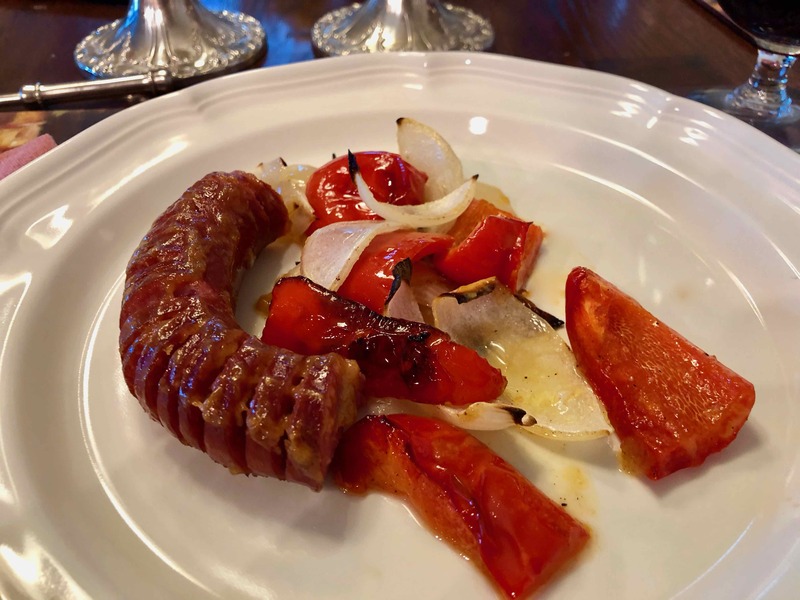 Although it takes almost two and a half hours to prepare, most of the dish’s cooking time is devoted to a long braise in the oven and the prep is relatively simple. I departed from the recipe only slightly by using chopped onions as opposed to sliced and substituting fennel seeds for the caraway. For the wine, I opted for a California Dry Riesling. My husband’s only other request was to serve the dish with a boiled potato to which I added butter and dill. Given that the evening weather was beautiful, we dined on the terrace just as the sun was setting. Maybe it was the lighting, but as I caught a glimpse of my husband’s face as he took his fist taste, he appeared to be aglow with contentment. 1- Preheat oven to 300°F. 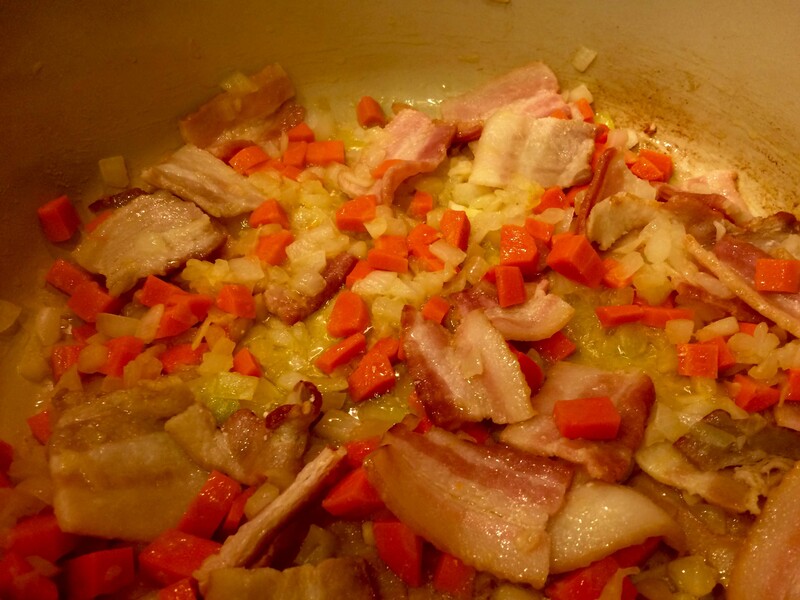 Place bacon, onion and carrot in heavy large ovenproof Dutch oven over medium-high heat. Sauté until onion is tender but not brown, about 5 minutes. 2- Squeeze as much liquid as possible from sauerkraut. 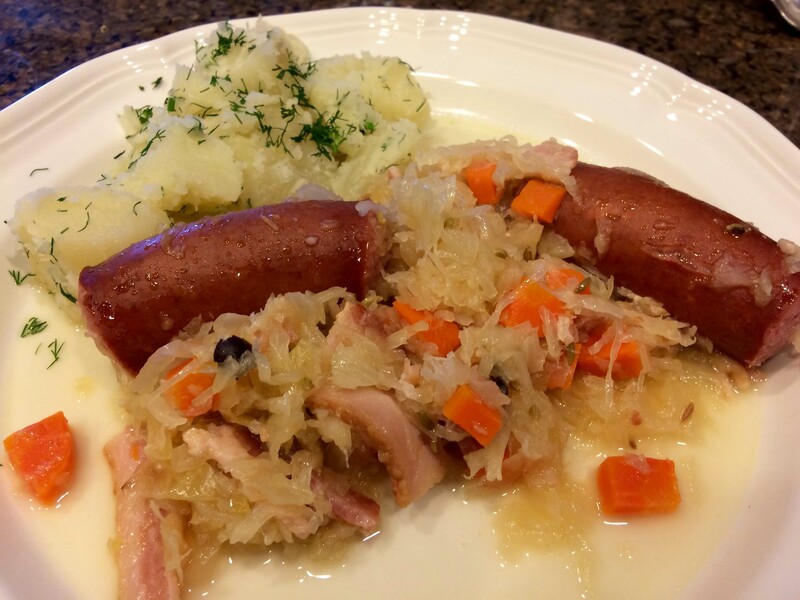 (I placed my drained sauerkraut in a clean dish towel and twisted until the sauerkraut gave up most of its liquid.) 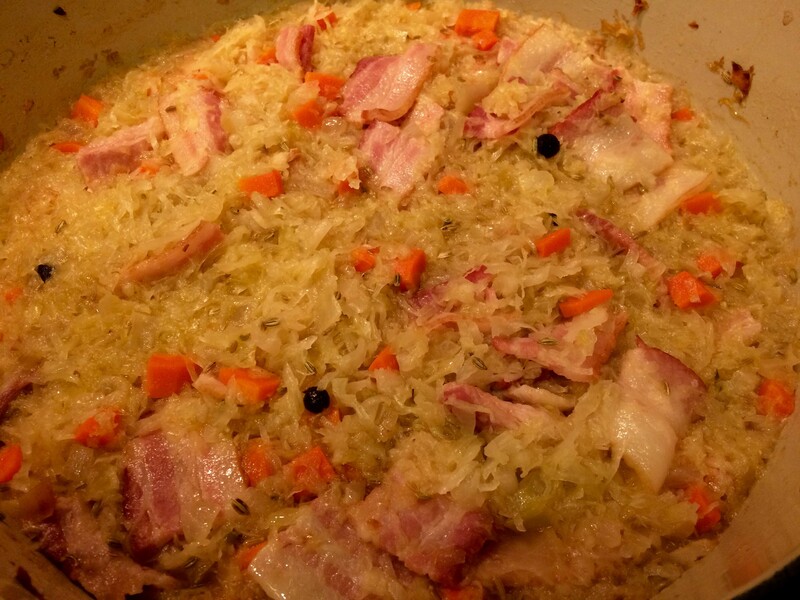 Add sauerkraut to Dutch oven. 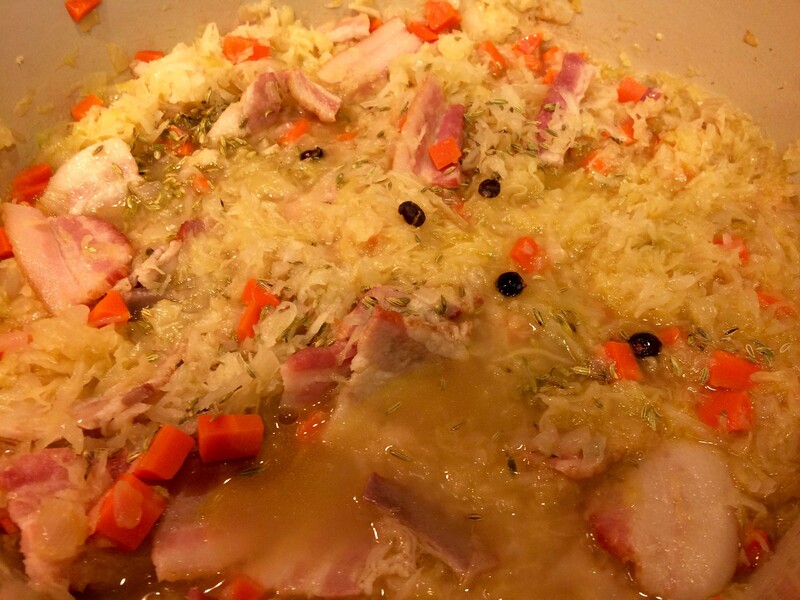 Add wine, stock, caraway seeds and juniper berries. 3- Bring to simmer. Cover tightly, place in oven and bake 1 hour. 4. 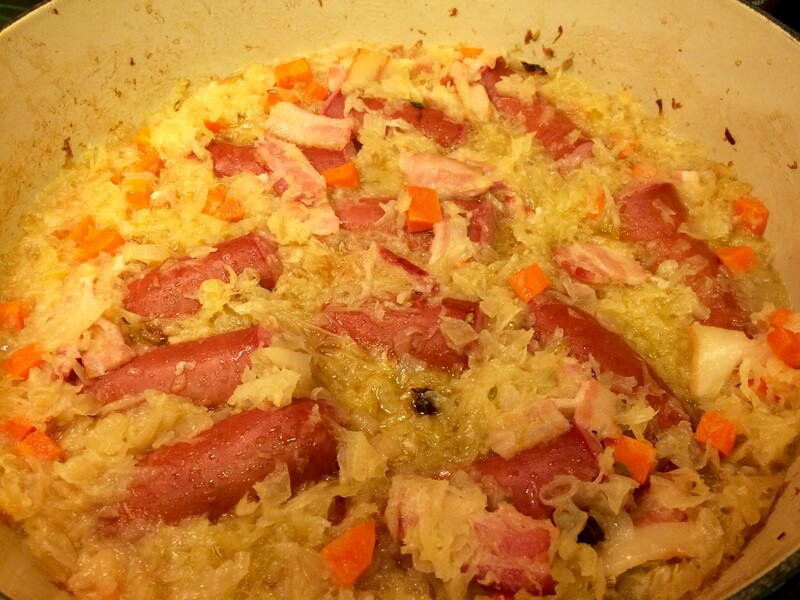 Add kielbasa to Dutch oven, pushing into sauerkraut.